Starting a wide format project can be overwhelming, regardless of whether it's your first one or your hundredth. What your project is printed on is an important element of your design and there are several factors that can influence which substrate to use. Get insight into materials available for your next project with this wide format substrates infographic! 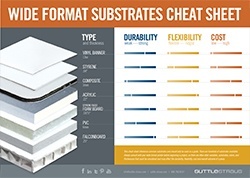 This handy cheat sheet is a visually appealing infographic that breaks down seven common substrates based on the durability, flexibility and cost of each.